Which State Drinks the Most? As REM once famously sang, everybody drinks. Or something close to that, anyway. 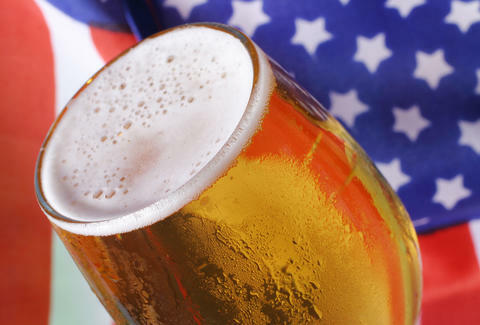 Either way, if you're an American (and chances are, if you read this website, you are), you may have wondered at some point: Which state drinks the most? Well, have no fear. The Center for Disease Control has answered your question. And it turns out, the answer is Wisconsin. Yes, it's true: The land of cheese curds and Don "Magic Man" Majkowski reported the highest percentage of drinking residents, with 65.33% of Cheeseheads consuming of at least one drink in the last 30 days. 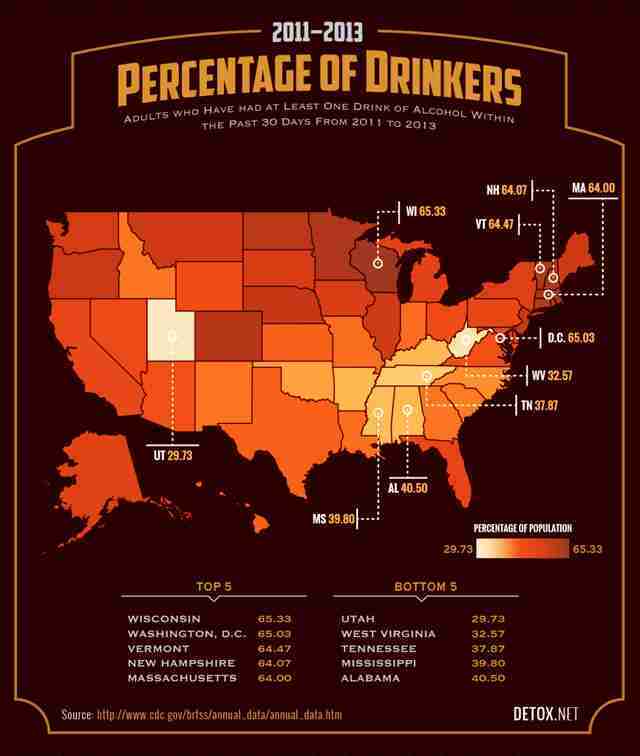 The Badger State narrowly edged out Washington, DC, which reported 65.03% of residents as drinking in the last month. DC may not be a state, but Washingtonians are clearly in the same state of mind. Which is minding matters in a bar, most likely. New England rounded out the top five, with Vermont (64.47%) in third, New Hampshire (64.07%) in fourth, and Massachusetts (64.00%) in fifth. What else do you do when you're snowed in? To no one's surprise, Utah ranked dead last in the survey, with only 29.73% of residents drinking regularly. The South accounted for the next-lowest states, including West Virginia, Tennessee, Mississippi and Alabama. You know, if you consider all those to be in the South. The folks at Detox.net, who put together these handy graphics, attribute the regional differences to lax laws in states with more drinkers, and stricter drinking laws in the states at the bottom -- citing specifically more religious (Church of Latter Day Saints in Utah and Bible Belt communities) areas having fewer drinkers. Despite all that "water into wine" talk, the Bible isn't a guidebook for partying, it seems. Check out more of the CDC info visualized by Detox.net, including breakdowns on race, age, and how much people drink.